With enough practice, this trackball will reward your time and effort. If you want an ergonomic input device, this is what you want. 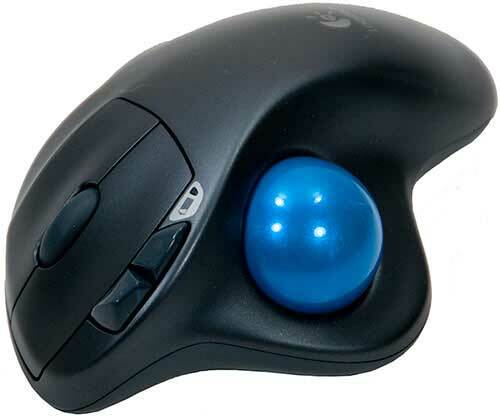 For anyone who has never held, let alone used a trackball, the M570 is going to look odd. It looks like a large mouse with a large gumball attached to it. Its main function is to provide a stable and highly comfortable grip for your hand while your thumb moves a small ball. The ball on the side covers the sensor which translates the ball’s movement into X and Y axis movement of your onscreen pointer. Letting your fingers do more work, in this case your thumb, repetitive motions with your wrists are greatly reduced. The small bones and cartilege in your wrist are much more prone to RSI’s than your fingers. Ergonomic mice in general try to minimize this by leaving your wrist in a neutral position and using your forearm and fingers to handle the motion. They can take some time to learn and are initially uncomfortable. Most users usually complete the transition in less than a week. With time you will become just as proficient as with a mouse. An added benefit is the desktop real estate requirements are much lower. Trackballs don’t need a mousepad area, they are completely stationary. You get a lot more desk to use when make the switch to the M570 or any other trackballs. The M570 will also take time to master, even for experienced trackball users. Most trackballs on the market today are controlled with the fingers and the thumb may have a button or two. The Logitech M570, on the other hand, is controlled with the thumb while the fingers remain motionless over the buttons and scroll wheel. The ball is extremely lightweight and easy to control. Returning to other models will be immediately fatiguing. 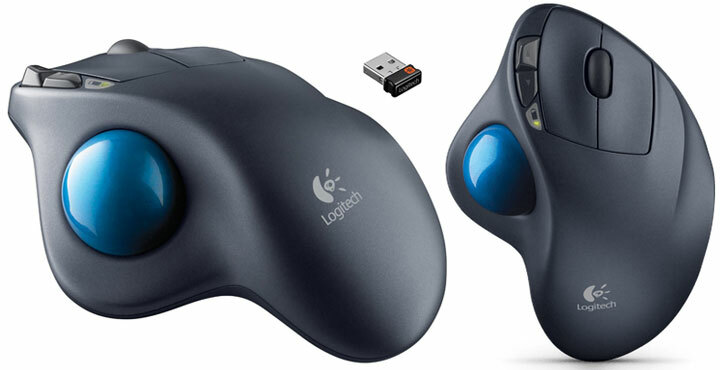 The Wireless TrackMan Wheel trackball from Logitech is the obvious precursor to the M570. Since then, Logitech has greatly refined their design. The Wireless Trackman Wheel’s USB transceiver was large and had to be placed near the trackball to work. Logitech has evolved its transceiver design significantly. Even better is the fact that this transceiver is part of the Unifying receiver line, meaning you can share the M570’s wireless dongle with a compliant keyboard. Then add in the fact that the M570’s battery compartment also has room to store the transceiver. This provides the extra option to use it as a traveling companion. Unlike previous models, the ball is firmly locked in place and can not fall out to get lost or damaged. The next biggest improvement is the battery life. The M570 requires one AA battery. According to the SetPoint software, it should be good for over 540 days and this is using a standard AA battery. (Update: 6 months usage on the original battery and battery is still going strong.) Logitech has also addressed the biggest downside to using a trackball compared to a typical mouse: buttons. The buttons are located in the same location that most modern mice have them. Except for the thumb motion, when held in your hand, the M570 works exactly like a normal mouse. All the function buttons rest under the normal mouse-oriented fingers. Only the thumb is retasked for different duties. I’ll predict that most trackballs in the future will follow this design. There’s not much more room for improvement as layouts go. The M570’s trackball has been cast with a very smooth plastic finish. This finish helps it stay clean and makes it easy to clean when necessary. It has fairly long lines channels for your fingers to rest in. This almost featureless surface combined with the smooth plastic can cause some slight problems. You might find yourself having to search out the buttons with your fingers or look down to set your hand in the proper location. A piece of tape or some eGrips on the side could save you some frustation and distraction if you encounter problems dialing your hand in. Over time, the tiny casters within the trackball housing will collect dust and grime. Cleaning is a cinch and should be done often to maintain consistent performance. Removing the ball takes a little pressure from the bottom portal with your finger. If your fingers won’t fit, use something soft. Make sure you are ready to catch the trackball as you remove it. Dropping it on a hard surface can dent the ball. Any imperfections in the ball will create catch-points as you use it and will be very annoying over the life of the device. Installation is a snap. Insert the battery, slide the power switch to “On” and plug in the Unifying receiver and your PC should do all the work. No additional software is needed. If you want to change the default button settings or configure other Unifying devices, you’ll need the software that comes with on the included CD. As with the Logitech’s gaming mice, the M570 uses SetPoint as its configuration utility. The default configuration should suit most users very well. I’ll review it as a matter of course but it is completely optional. The software itself is extremely user-friendly and has plenty of popup explanations to help. It is an easy, straightforward and yet much more powerful then previous versions. Additionally, if you do have multiple Logitech devices installed, they each will get their own “tab” and thus allow you to configure and control them all via one software window. Users of regular mice or other trackballs will quickly gain proficiency. After the initial break-in period for your thumbs, you will quickly appreciate the relief on your wrists, arms and shoulders. Wireless range is superb at distance and suffers no interference if your USB ports are tucked behind other equipment. 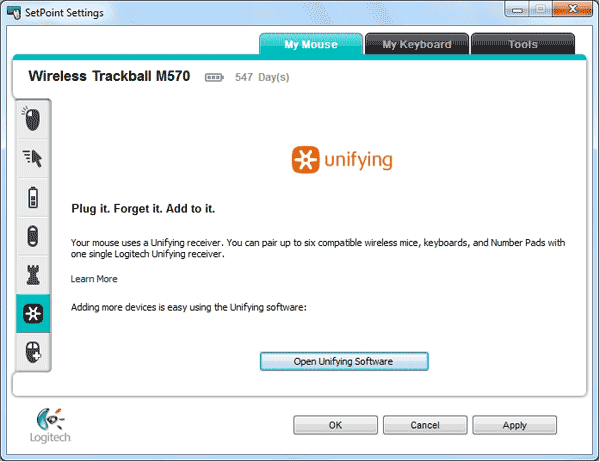 With that being said, a trackball is not a device you can simply pick up and start using right away. Based on my own experience, it will take you a good 20 hours or more to get the hang of it. People who are complete novices to computers and really haven’t learned any “bad habits” from using a mouse will require less time. You will need to force yourself to use this to get past that initial barrier. The familiar placement of buttons and scroll wheel greatly reduces the amount of change and will allow you to regain proficiency quicker than other options. Here are some tips for those ready to make the switch. Experiment with different placement locations for the M570. Try moving the trackball from the mouse’s customary right hand position to just below the space bar, this can reduce torque on the shoulder and neck. Take frequent breaks stretching your shoulders and hands. You are using an entirely new set of muscles, they are going to ache. Having some ibuprofen handy isn’t a bad idea either. Keep in mind that RSI problems, once developed, take years to heal. Making this small and only temporarily uncomfortable change can save you a lot of time, money and serious pain in the long run. 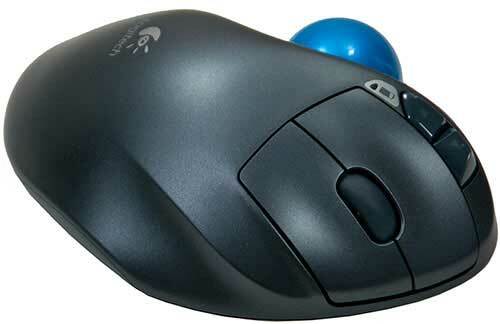 People who take the time to get acquainted with a trackball seldom revert to mice. That being said, this is one of the most easiest, most user friendly trackballs I’ve ever used. The wireless connection with its Unifying technology works and works well. Its insanely long battery life coupled to the fact it only needs a single AA battery is impressive. What truly sets this trackball apart is the added buttons and their positioning. If you are experiencing any wrist discomfort symptoms and are looking for relief or just want to try something new, this is a fantastic option that, given enough time to learn, will meet your needs well.